Funny how a picture can affect you so much. I have often thought about that. Over the years I have seen countless furry faces peering out at me through the screen needing homes, or some kind of support, for medical help and I have tried to do what I can. I have often wondered what if I hadn’t checked my computer that day…or missed the posting of the photograph that ‘spoke’ to me so much. I have also wondered if the path of saving Brin was also a path for saving myself in some way. He had become my total focus, my passion. I knew nothing about Brin apart from what I had been told and even less about the country from where we were hopefully going to pluck him from. I began to read books to educate myself about the people, the landscape and, above all, the history. ‘My Forbidden Face’ by Latifa was one book that taught me so much about the plight of the people who have blighted by war for over 30 years. It is an insight to one families life and how how it changed within 24 hours with the invasion of the Taliban in Kabul and their life beyond. It also gave a stark insight to the abandonment of their domestic animals through fear of persecution. What would happen to Brin if he got out had not occurred to me either..I assumed Mark would care for him or someone else who had known him at the base. I already had three elderly collies plus a cat and, somehow, living with Brin had not come into the equation. As for Brin, all had gone quiet for while. Cpt Mark had returned home for a 2 week rest and Brin was left in the care of others at the base. Nowzad were working behind the scenes to find a way to rescue him. Where can you find a list of dogs that can be rescued from over there? 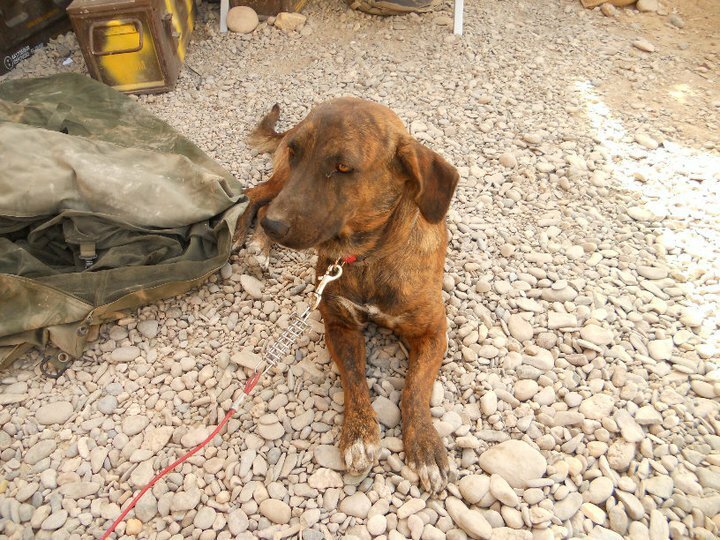 Nowzad have a few dogs available for adoption. you will find information on there. I am so glad Brin was rescued!! Every animal deserves to be loved.